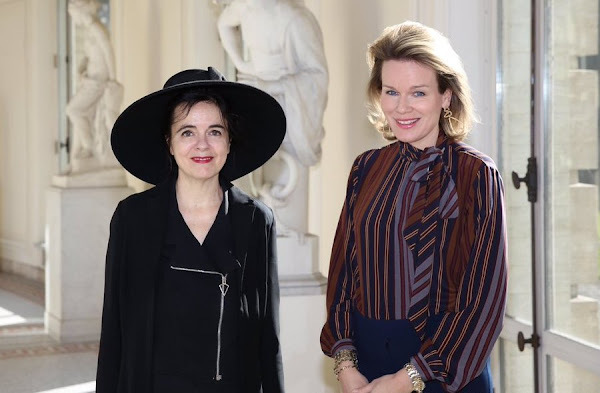 On February 19, 2016, Queen Mathilde of Belgium met with author Amelie Nothomb at the Royal Palace in Brussels, Belgium. Well, she's home - or what passes for a home, although that palace is for receptions etc., no one lives there. Did she borrow one of Queen Paola's blouses? could be so!!! Queen Methilde has really ups and downs in her clothing style! Well, actually it is a kind of 70's style blouse and that is in fashion right now but depends on how it looks on the person and how you match it with your other clothes and hair style. With Mathilde it does not look good at all. Queen Mathilde meeting the witch from Oz?